It's nice to see musicians who let the music move through them. It's nice to see a band that looks out into the audience and genuinely smiles. It's nice to see the leader of that band make the audience feel like they are in their living room but she is always in control. Nice is too small an adjective to describe Toshi Reagon and Big Lovely's performance on Thursday night. (but hey!, I was on a roll.) Better words would be heartwarming, moving and musically rich. I had heard Toshi Reagon's name mentioned by musician friends through the years but I had never heard her music. So, when I saw her gig listed on the site for Joe's Pub, I knew it was time to check her out. I started by listening to her music online. My first thoughts were that her songs were really well written and that there is a 60's and 70's sensibility. The songwriting and her music itself reminds me of Bill Withers, Joan Armatrading, and Janis Ian with a touch of Beatles thrown in. However, the strength of her music lies in her live performance. Toshi Reagon's show was billed as her 25th Anniversary Birthday Concert. But what I didn't know was that her birthday concerts were a tradition at Joe's Pub for most, if not all, of those 25 years. Needless to say, the audience had seen her many times before and knew it was a special night. Toshi Reagon's friends and family were there but so were newbies like myself. 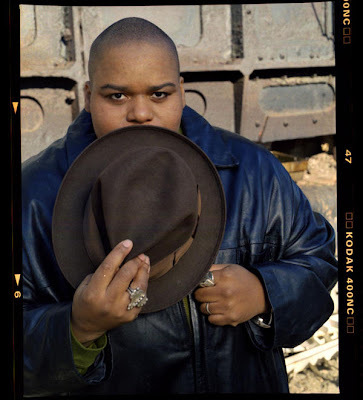 Toshi Reagon and Big Lovely eased into the opening song “Burden Down.” Along with Toshi, her three accompanying vocalists Gina, Marcelle and Judith gave the song it's rich gospel feel. During the song, and in other parts of the show, Marcelle Davies Lashley played tambourine and Judith Casselberry played guitar. Along with Gina Breedlove, the three ladies were enjoyable to watch because each had their own distinctive personality. Together with or backing Toshi, the three ladies voices worked as one unit making beautiful harmonies throughout the show. Many of Toshi Reagon's songs made me and the audience want to sing along. There was honestly one point when I was singing along and I wasn't even aware I was doing it. This compulsion to sing along started early on during the show; even Toshi's mother was feeling it. When the band finished the folk song “There and Back Again,” Toshi's mom called out for the band to play the chorus again so she and the people at her table could sing along. Toshi complied, we all sang along. Starting with the song “Little Light” and through several of the following songs, I picked up on the dynamics in Toshi Reagon's performance. She could go from a very quite feel, of just her and the acoustic guitar, to an all out funky blues with the band in toe. A song that really brought out the interesting quality of her vocals was “Sweet in the Morning.” Haunting guitar and the India like vocal give the song a sort of 60's psychedelic feel. In concert, Toshi softly elongated the notes making them even more interesting than on the recording. “Sweet..” is essentially a blues but I wasn't getting that until I heard the lyric “Baby don't ya be no back door man” and then heard Adam Widoff 's gritty electric guitar solo on the break. Hmmm....kindness. There was a portion of the show where Toshi mentioned how you can see whether a persons soul is good or bad by what they do. Well, then everyone at Joe's Pub who spent an hour with Toshi Reagon and Big Lovely definitely saw their souls....and it was all good.